Here's the list of products provided by us. To get more information about these products, please click on the image or the name of the product. 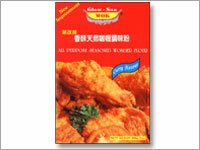 All purpose seasoned wonder flour. To add an item into the selected list, please check the checkbox beside the item. After selecting the item(s), click on 'Add to Enquiry / RFQ' below.